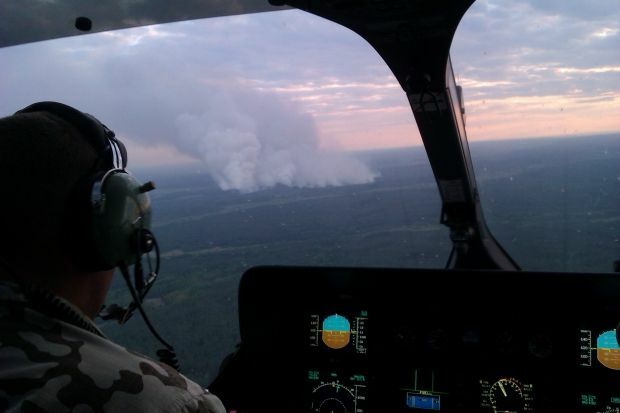 Aviation has been involved in fighting fire in the Chornobyl exclusion zone, and the situation is reported to be under control, Chief of the State Service for Emergency Situations Mykola Chechetkin said, according to Ukrainian newspaper Ukrainska Pravda. He confirmed that dry grass and reeds had caught fire and was burning in the Chornobyl exclusion zone. "We have enough equipment and people to keep everything under control. We have already involved aerial firefighting," Chechetkin said. It is currently difficult to predict when firemen will be able to eliminate the fire, given also the weather conditions. In addition, Chechetkin refuted a statement by Ukraine's Minister of Environment and Natural Resources Ihor Shevchenko, who said that the grass was burning outside the exclusion zone. "The fire is within the exclusion zone, at its border, but within the 30-km zone," Chechetkin said. First Deputy Chairman of the State Service for Emergency Situations Oleh Melchutsky later announced at a briefing in Kyiv on Tuesday, that the nearest outbreak of the fire is at a distance of 30 km from the shutdown Chornobyl nuclear power plant's facilities. He also confirmed that firefighters had managed to localize four out of the six points of the outbreak of the fire by 1630 Kyiv time on Tuesday. Kyiv City Administration assured UNIAN that the radiation background in Kyiv was within the norm on Tuesday evening. As UNIAN reported earlier, dry grass and reed were reported to have caught fire in a Chornobyl forest in the Chornobyl exclusion zone on Monday, June 29.